Scelsi, Giacinto (b. 1905  d. 1988, Pitelli - La Spezia). Italian Composer. 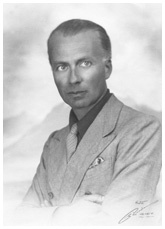 Giacinto Scelsi (1905 -1988) frequented the artistic, musical and literary world in the course of numerous visits abroad during the Twenties. His interest in the languages and techniques of composition, such as dodecaphony and the theories of Skrjabin and Steiner, date back to the Thirties. In 1930 he completed the orchestral work Rotativa (presented in Paris, Salle Pleyel, 1931, conducted by Pierre Monteux), which made him known to the international world of music. He passed the Second World War in Switzerland, where some piano compositions were performed. During the Forties, interest in poetry, visual arts, oriental mysticism and esotericism dominated his activities. In the Fifties he moved to Rome, where he remained until his death on 8 August 1988. Scelsis compositional method is somewhat original: he recorded his improvisations on magnetic tape, subsequently entrusting the transcription to collaborators who worked under his guidance to realize the final score. The instrumentation of figures determined at random, the improvisation on traditional instruments adopted in a new way, the use of the ondiola in the compositional process, imprint his more significant works for orchestra (Quattro pezzi (ciascuno su una nota sola), Aiôn, Hurqualia), choir and orchestra (Konx-Om-Pax, Uaxuctum), voice (Hô, Canti del Capricorno), ensemble (String Quartet nn. 1, 2, 3, 4 and 5) and solo instruments. The edition of his theoretical and literary writings date back to the end of the Forties; since the Eighties Editions Salabert of Paris have published Scelsis impressive musical production.